Root canal treatment (also known as endodontic therapy) aims to clean, shape and fill the entire root canal of a tooth. A root canal infection can be caused by several things, including decay, injury and possibly also gum disease. 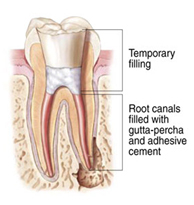 Root canal treatment can repair your damaged tooth without it having to be removed. 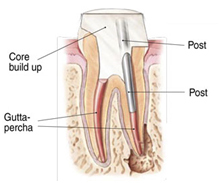 The aim of root canal treatment is to get rid of the damaged pulp and the bacteria that are causing the infection. It involves removing inflamed or dead nerves and blood vessels from the centre of your tooth. This is done by drilling a hole through the top of your tooth to the root canal and removing the dead tissue. 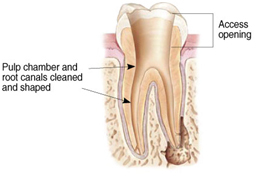 The empty root canal system is then cleaned, filled and a permanent seal put over the top of your tooth. The procedure may be carried out over one or two visits to your dentist. Your teeth have a core of blood vessels and nerves at their centre. 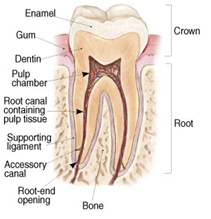 This living tissue is called the pulp and is in a space called the root canal. The number of root canals varies depending on how far back the tooth is in your mouth. Front teeth often have just one root canal, while back teeth may have three or more. If your tooth is injured or has severe decay, the pulp can be damaged and the blood vessels may die. This results in a "dead" tooth which is likely to get infected because it's no longer protected by your immune system. All of these conditions can lead to bacteria getting trapped in your teeth. There is then the possibility that the tooth pulp will become infected, causing blood vessels and nerves to die. Without treatment, a collection of pus (abscess) can form at the root tip. This can lead to pain and swelling and may cause damage to the bone around your tooth. 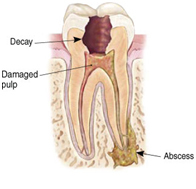 If you don't have treatment to remove the infected tissue, you may have to have the whole tooth taken out (extracted). You may find that you have some discolouring in the tooth that has been treated, although this is less common now as techniques have advanced. However, if your tooth does discolour, you may be able to have treatment to correct it. After treatment it's important that you take care of your repaired tooth as you would any other. Brush your teeth at least twice a day and visit your dentist regularly. It's unlikely that you will have any further problems following root canal treatment. However, if your tooth does become infected again, your dentist can repeat the procedure, although the rate of success is reduced with subsequent treatments. Very occasionally after root canal treatment, you will still have inflammation at the tip of your tooth. You may need to have a procedure called an apicectomy to remove the root tip. What are the complications associated with root canal treatment? Breaking off of the dental instruments or files in the root canal while cleaning the pulp chamber. This can be removed later but only by a specialised endodontist. Root canal treatment procedures are relatively comfortable and often painless as the tooth is anaesthetised during treatment. 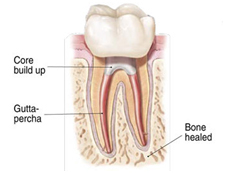 After treatment, the tooth may be sensitive or tender for a few days due to inflammation of the surrounding tissues. This discomfort can be relieved by taking mild analgesics or painkillers available over the counter at the pharmacy. However, if the pain persists, or gets worse (e.g. more intense; swelling), you should contact your dentist as soon as possible. The symptoms of pulp nerve damage may resemble other oral health conditions. You should consult a participating dentist for a diagnosis.